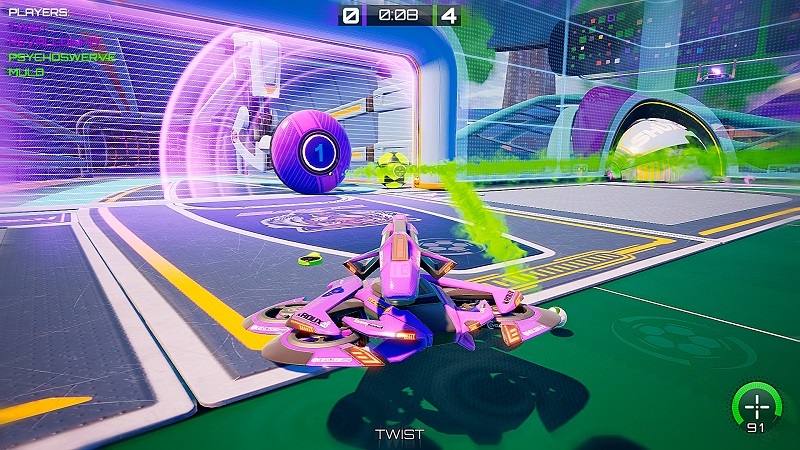 Under development by Earthbound Games, Axiom Soccer is a futuristic sports game that looks to combine elements of football and third person shooters in a game that takes influence from the likes of Rocket League, FIFA and Splatoon to create something a bit different. When first getting in to the game, the Rocket League influence is immediately apparent. You’re piloting a space craft and trying to get a ball into the opposition goal. However, the biggest difference is that you have a variety of weapons at your disposal. Each weapon works in a different way, and you have to use them to both score and to prevent your opponents from doing the same. They have limited energy, however, and you have to be in your own goal area in order to recharge. In another difference to Rocket League, there is a goalkeeper who you can manually move around. Plus, if the ball goes into a corner, it’s immediately bounced straight back out into the field, so there’s no getting stuck in there. There are also obstacles that appear in the field, such as pillars that you’ll have to try and weave through. With the ability to have 1 to 3 players per team, there’s something for everyone here. Anyone who loves futuristic soccer and third person shooters should get a real kick out of this. In the time I spent with it, it certainly felt easier to get into and be competitive in than other games in the genre. Axiom Soccer will be available on Steam in Early Access from April 11th. You can check out more on Steam here.